Many people will be out and about today looking for migratory birds in honour of World Migratory Bird Day. Across the world countless millions of birds are taking the life gamble on moving from one region to another, some making the ultimate sacrifice in order that their species will continue. It is an ancient challenge that has proved successful to birds for a variety of reasons. Great Knot Calidris tenuirostris gather in great flocks on migration. Pak Thale, Phetchaburi, Thailand. January 2014. However the goalposts have moved somewhat, we, as a species, are changing the face of this planet at such a rate that evolution is being left behind and these age old strategies are not working so well for these creatures. Stop-over points are being destroyed wrecking the carefully honed migration biology that has developed over many thousands if not millions of years. Some feel it is their right to blast these birds out of the sky for no other reason that in it fun to do so, witness the events that occur in places like Malta and Lebanon, and yet somehow many of these miracles of life make it through albeit less and less and among the greatest of migrants are some of the waders. There are two species that stand out for us, we have previously talked a lot about the Bar-tailed Godwits of the race baueri, that ironically are safer flying direct to New Zealand across the pacific Ocean than they appear to be by flying in two shorter hops via the Yellow Sea in Asia. If the destruction of the inter-tidal zone in that region continues at the rate it is now, there will be nowhere for these birds to rest and feed, the result being that they will perish, an entire population is at risk once more because of man’s desire for economic growth above all other considerations. Bar-tailed Godwit Limosa lapponica baueri; recently arrived from its marathon flight from Alaska. Some recent arrivals droop their wings in this way due presumably to the exertion of the flight. The second species is the Red Knot. This species has one individual which bears the flag number B95 that has been dubbed the 'Moonbird' due to its longevity and long distance migrations. It has been calculated that it has flown the equivalent distance of travelling to the moon and half way back again in its exceptionally long lifetime. On this blog we are following the migration of some radio tagged Little Curlews on their route north from Australia. One has reached China in the last few days and will stop there for a while before moving on. In this project we can find out not just where these birds go but also follow them along their journey, learning so much more and arming us with more information to help protect the birds and the habitats they rely on. 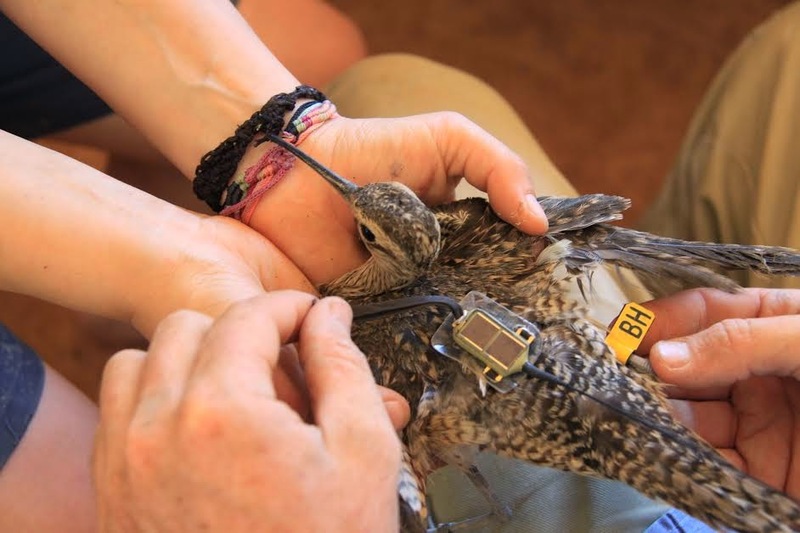 Little Curlew Numenius minutus being fitted with a satellite transmitter. Photo: Robert Bush. We hope that important ideas like World Migratory Birds Day, World Shorebirds' Day and our own World Watch will highlight to a growing number of people that we simply cannot continue to destroy our planet at this rate with no regard for the other creatures that share it with us. É que o homen perceberá que não pode comer o dinheiro. Will mankind realise he cannot eat money.